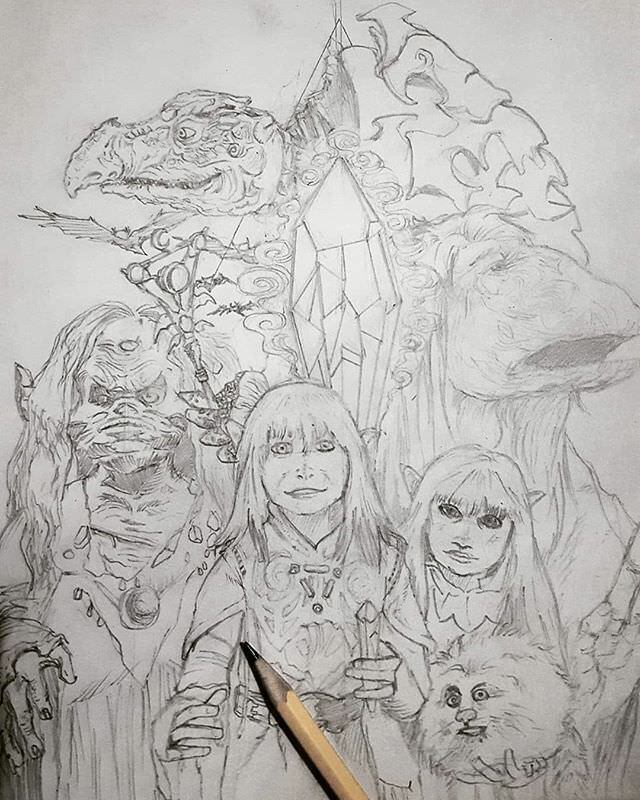 The first piece I’d like to show is my fan art of The Dark Crystal, a 1982 fantasy adventure film directed by Henson and his friend and frequent collaborator, Frank Oz. The story was written by Henson with screenplay by David Odell. All three worked on The Muppets Show, and while The Dark Crystal was marketed as a family film, it was much darker than its creators’ previous material. ’80s kids surely remember this film and those who were kids in the ’90s like myself may recognize it as a movie they used to watch on VHS or one of the weird but interesting movies occasionally shown on TV. I rewatched this sometime in January and fell in love with the exquisite characters and grand sets Henson and his crew–Jim Henson’s Creature Shop–built. The fact that the special effects in this movie (which starred no human characters) were almost purely done by hand using animatronics and puppetry is just completely mind-boggling. When you think about how movies these days get by with worlds created using CGI, they almost seem lazy when you compare them to the monumentally backbreaking work required to produce a film like The Dark Crystal. The most magnificent creatures in this movie were the good Mystics and the evil Skeksis. 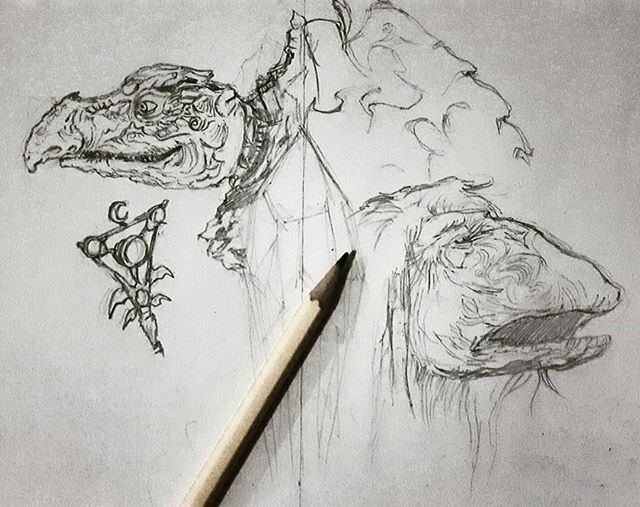 My main concern while I was sketching these two was if I could replicate the intricate beauty of their designs since I felt that a lot of their “magic” was in the detail–and these creatures were some of the most detailed things I’ve ever seen onscreen, modern CGI creatures included. Given the level of detail needed to achieve the look I wanted, it took me quite a few days to finish the pencils. There were a few more characters I would’ve wished to include but they simply won’t fit in the size of the paper I was using, so in the end I ended up drawing Jen, the main character, Kira (a gelfling lady and also Jen’s love interest), Fizzgig (Kira’s pet), Aughra (a good witch), Chamberlain (a Skeksis), and a Mystic. 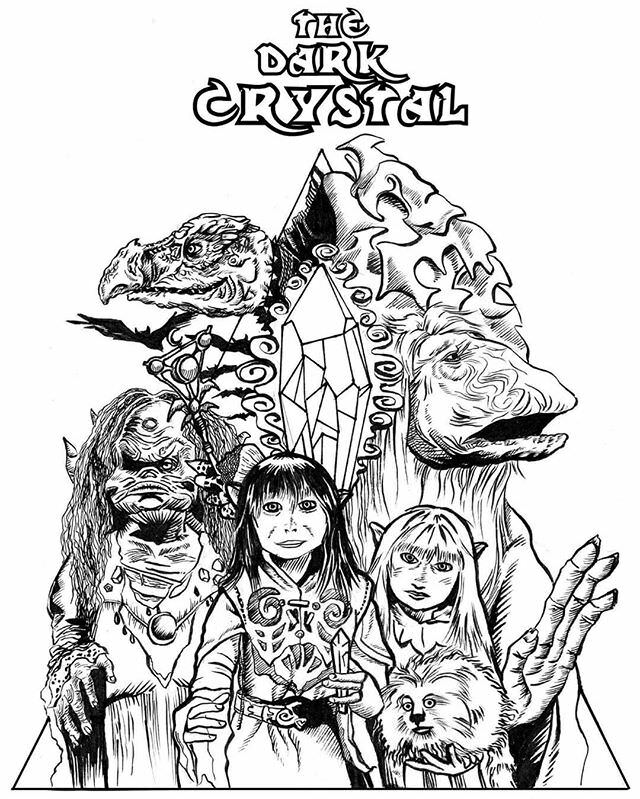 While there’s a small community of geeks who are Dark Crystal fans, I wasn’t really counting on this design to get a sale when I uploaded it to my online store. I was surprised that not two days had passed since my upload and I already got a notification that someone purchased a sticker of my illustration. I was elated, of course, and very glad that there are still people out there who are actively looking for merchandise about the movie. 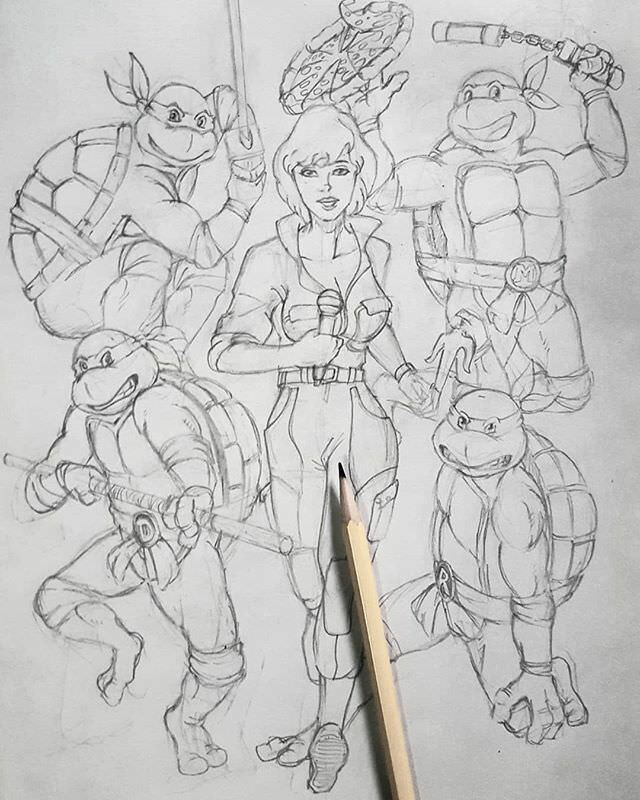 In contrast with The Dark Crystal, everyone knows who the Teenage Mutant Ninja Turtles are because the franchise has had various incarnations in different types of media over the decades since its inception in 1984 as an indie comicbook created by Kevin Eastman and Peter Laird. 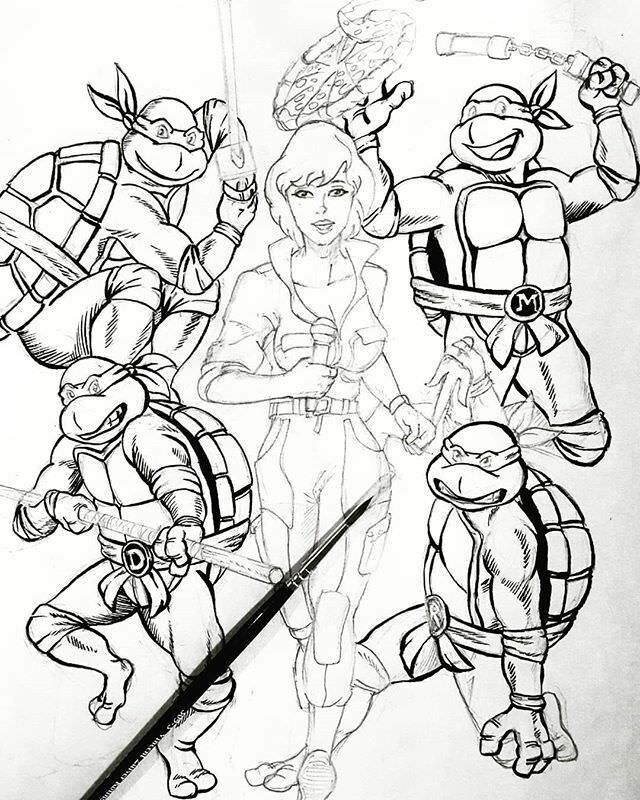 Much of the mainstream popularity of TMNT was due to the smash hit animated series in the ’80s created by the animators at Murakami-Wolf-Swenson. The cartoon was produced primarily to sell action figures by Playmates Toys (and if you have those classic Playmates Toys, they cost a fortune now). I rediscovered my childhood love for the TMNT after rewatching the 1990 movie of the same name. Not long after seeing The Dark Crystal, I was amazed to find out that the costumes for this movie was also done by Jim Henson’s Creature Shop, which explained why they looked so great. The 1991 sequel was the last film to feature costumes and special effects by Henson’s company; the third film in 1993, cutting back on its budget, used different costumes, which were noticeably bad compared to the originals. Immediately upon finishing the 1990 film, I found myself getting crazy over Turtles. I started rewatching the ’80s animated series and also began the 2012 CGI series. I remembered how I loved the ’80s cartoon as a kid and just wishing I had lots of TMNT toys (I never had a decent one, just a few knockoffs). Drawing this piece was automatic for me, and to drive the nostalgia up a notch, I made sure to draw this one as close to the original designs as possible. 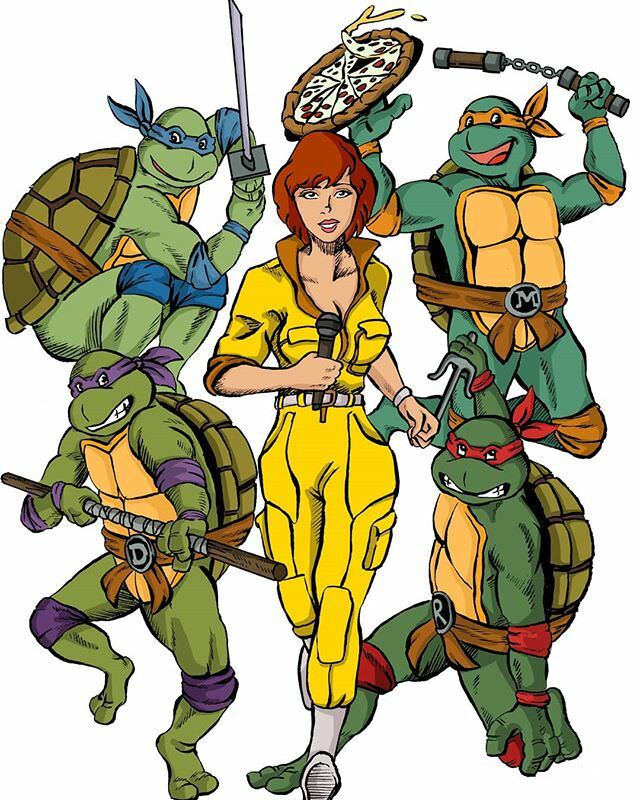 Figuring out which characters and elements was easy–there had to be all four turtles, April O’Neil (because this group isn’t complete without her), and, of course, pizza. Love the post. I agree. Jim Henson and Frank Oz are true masters. Practical effects is a dying art it seems. Nice fan art too! 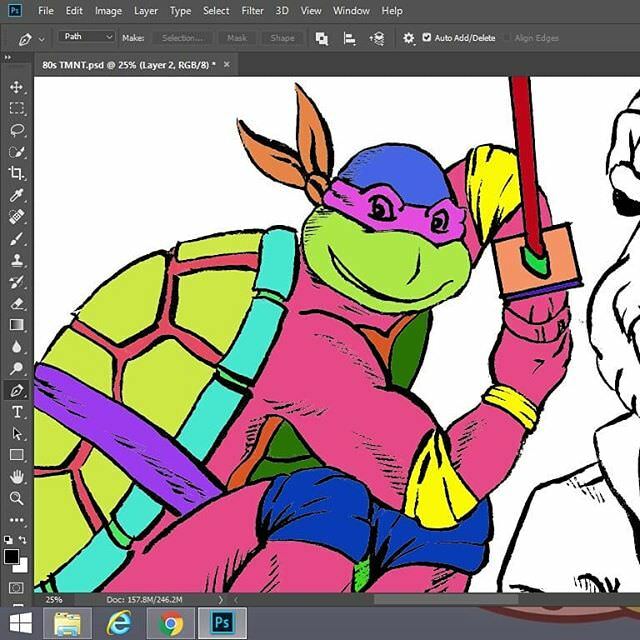 TMNT rock. Thanks so much! In general, yes, practical effects is a dying art most probably because CGI is a lot cheaper to do but not necessarily the one with the better results all the time. These new Star Wars films and Guillermo del Toro’s movies have been trying to bring them back, but there’s still so much untapped potential. I really wish a studio or a movie would take a chance on animatronics soon. I was kind of hoping it’s the next TMNT movie, to be honest, seeing as the Michael Bay CGI fest with the ugly monstrous turtles are probably over, and TMNT is bound for a reboot onscreen. Going back to what made the first movie work should be on the table. With the advances in technology, I really believe practical effects can exceed everyone’s expectations. I have great respect for Del Toro also. I had the good fortune to see him at Comic Con. He is an amazing director, storyteller and monster creator. I am so happy he won several key oscars, like best director, for The Shape of Water, giving props and credibility to the sci fi/fantasy genre !